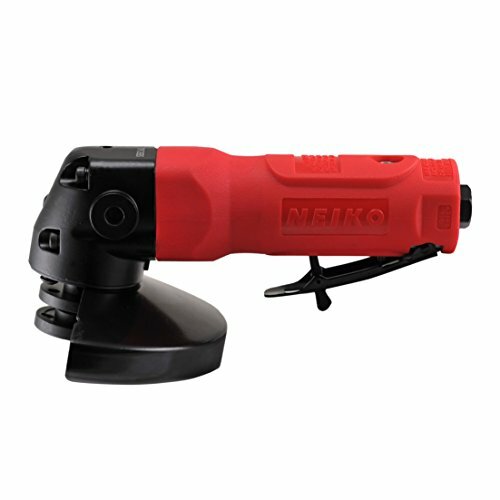 This powerful yet comfortable air angle grinder delivers great results in any of your removal projects. The powerful twin chamber engine is designed to perform while being stall torque resistant so you can continue work without any major disturbances. The composite body is built to last while side handle and ergonomic grip allows you to perform your work without hand fatigue. This air angle grinder functions at 5cfm air consumption, 90 psi air pressure, 3/8" hose size, 1/4" inlet size and air angle wrench included in the set. A great addition to any serious home mechanics and diy'ers that work with cutting, grinding, rust removal, and surface preparation projects around the household.